Endgame for Sasikala and family? TTV Dinakaran has hit out at Chief Minister E Palaniswami after being relieved of party general secretary post. In a dig at the CM, he has questioned why others appointed by Sasikala were staying on. TTV Dinakaran takes on Palaniswami, asks if everyone else appointed by Sasikala can continue, why can’t he. Palaniswami has been hand-picked by Sasikala for the CM’s chair before she was jailed. “If we approach the Election Commission, Palaniswami will lose the CM’s chair. No one can remove me from the party. Only person who can remove me is Sasikala,” says Dinakaran. The bypoll to Jayalalithaa’s RK Nagar Assembly constituency became another flashpoint between the two factions. Apart from voter bribery, Dinakaran was also accused of trying to influence the Election Commission to win the party’s “two leaves” symbol which had been frozen by the poll panel. His alleged middleman was Sukesh Chandrasekhar, a notorious conman. Convicted in a disproportionate assets case, in which Jayalalithaa was also an accused, Sasikala named E Palaniswami as her proxy. Her camp then moved party MLAs to a resort ahead of a crucial trust vote. The violence-marred floor test eventually ended with Palaniswami becoming the CM. Panneerselvam, a Jayalalithaa loyalist and many-time proxy CM, took the chair when the AIADMK supremo passed away in December. He announced his revolt from Amma Memorial in Marina Beach when Sasikala became the party’s legislature party head. Sources in the Panneerselvam camp, however, say Palaniswami continuing as CM and Panneerselvam becoming the party general secretary is not a solution. They want Panneerselvam to return as the CM. Political analyst RK Radhakrishnan says the “deal” is as good as done. “Dinakaran has been clearly told he has no powers. E Palaniswami will remain the CM,” he said. Speculation is rife that Panneerselvam may take the post of deputy CM. Formally expelling both Sasikala and Dinakaran was among the pre-conditions the Panneerselvam camp, which is also holding consultations on the possibility of merger, had made. The move in both camps is being perceived as coming one step closer to a merger of the two camps by easing out Sasikala and Dinakaran. 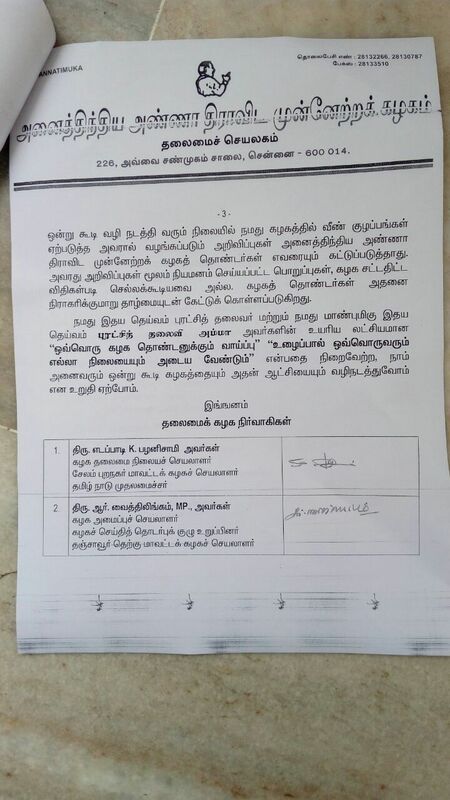 The resolution says the appointment of Dinakaran as deputy general secretary of the AIADMK was against party rules as he openly questioned their authority. This is the first time that the chief minister has made a categorical assertion about the status of Dinakaran's appointment by his aunt Sasikala on February 14 just ahead of her incarceration. A copy of the resolution. Sasikala is a Bengaluru jail after being convicted in a disproportionate assets case, while Dinakaran has been accused of trying to bribe the Election Commission in the battle for the party’s “two leaves” symbol. A resolution signed by Chief Minister E Palaniswami has removed Sasikala's nephew TTV Dinakaran as the party’s deputy general secretary and invalidated all appointments made by him. After months of factionalism, the AIADMK seems headed for a merger between the O Panneerselvam and E Palaniswami factions, with the Sasikala camp set to lose cointrol of Tamil Nadu's ruling party.